Defiance. | Dreams are the poetic expression of the soul. 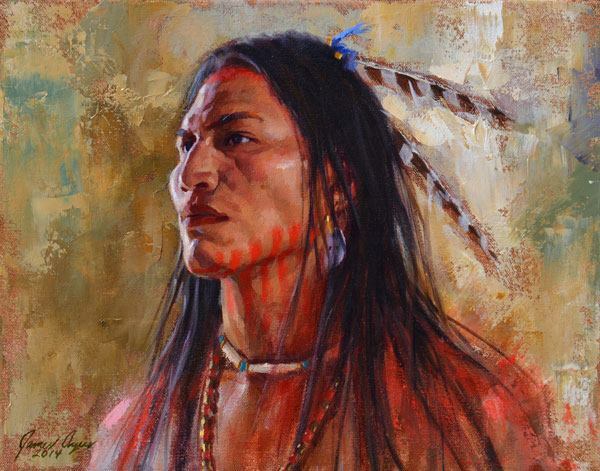 Proud Lakota warrior. I love this artist’s works; truly uplifting. This entry was posted in 21st Century American Art, American Art, American Artists, Art, Artists, Contemporary American Art, Contemporary American artists, Contemporary art, Creative Genius, Oil on canvas, Oil paintings, Painting, Private Art Collection and tagged Amerindian cultures, Amerindian Peoples, James Ayers, Lakota, Lakota Warrior, Oil on canvas, Paintings, SouthWest American Artists. Bookmark the permalink.